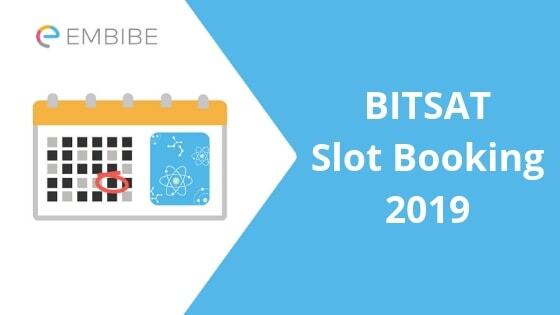 BITSAT Slot Booking 2019: BITSAT slot booking process has already started and the last date to book your slot is 12th April 2019. The BITSAT slot booking process is based on a first-come-first-serve policy and, thus, candidates are advised to book their exam slot for the upcoming exam as soon as possible. Candidates need to visit the official website to book their BITSAT test date and time. Candidates will have to enter their credentials and login to their account in order to book their test slot. Candidates are required to choose the exam date and the slot for the upcoming BITSAT exam and the same will be indicated on the admit card once released. The BITSAT slot booking will close on 12th April 2019 and candidates must book their date and slot as per their choice before this deadline. Otherwise, candidates will be allotted a test date and slot on the discretion of the exam conducting authority. Once the BITSAT slot booking is done, BITSAT admit card will be released with the details of the exam centre, date, slot, etc., mentioned on it. Thus, it is very significant to choose the exam date and slot as per your choice. Here, we bring you detailed information regarding the BITSAT Slot Booking 2019. Book Your BITSAT Date & Slot Now! The slot booking process will be based on a first-come-first-serve basis. Candidates need to reverify the details as the exam dates and slots cannot be changed once entered. Candidates need to select the slot and exam date within the time span as announced by the official authorities. If the candidate does not book the slot, it will be automatically allotted to the candidate by the official exam conducting authority. BITSAT slot booking dates are already announced and the slot booking process will end on 12th April 2019. Candidates who have successfully applied for the BITSAT exam can exercise the BITSAT slot booking within the time limit announced. Now, let’s go through the detailed process to book a slot for the upcoming BITSAT exam 2019. Login: The first step is to log in into your account by entering your login credentials such as BITSAT Application Number and Password. Selection of the Examination Centre: Once the candidate has successfully logged into their account, he/she need to choose the Exam Centre from the list available according to your preference. Choose the Test Date: After choosing the test centre candidates need to choose the test date as per the availability and their preference. Choose Test Time: Candidates now need to choose the test time. The test will be conducted in two sessions and candidates need to choose a session which will either be morning session or evening session. Once you have filled all the above details, verify them once and submit the details. You have now successfully booked the slot for the upcoming BITSAT exam 2019. Once the candidates have booked the slots as per their preference for BITSAT 2019 the officials will then be releasing the BITSAT Admit Card 2019. The BITSAT admit card will be having the test date and the slot of the examination same as opted by the candidate during the BITSAT Slot Booking process. Candidates need to verify all the details and take few hard copies of the BITSAT Hall Ticket. If any discrepancies are found by the candidate they must immediately contact the officials regarding the issue. We have now provided you with all the information regarding BITSAT Slot Booking 2019. It is advised to complete the BITSAT slot booking as early as possible in order to have better availability of dates and slots for the exam. For now, first, book your test date and slot for BITSAT 2019 and gear up your BITSAT preparation 2019. You can make your preparation much more interesting by learning the engineering concepts on the Embibe digital platform. Besides that, you can also practice JEE Main questions at Embibe as the syllabus for most of the engineering entrance exams are the same and strengthen your concepts from the fundamental level. You can also take the Embibe’s BITSAT Mock Tests for your BITSAT Preparation 2019. Along with the full-length mock tests you can also take the BITSAT previous year test which will help you know where you are going wrong. You will also get a detailed test analysis which will help you to learn from your mistakes and improve your score. Taking the tests will not only improve your knowledge but also your test-taking skills. Thus take BITSAT mock tests and take your performance to the next level. We wish you Best of Luck for the upcoming BITSAT 2019. We hope this article on BITSAT Slot Booking helps you. if you have any question feel free to comment below. We will get back to you at the earliest.